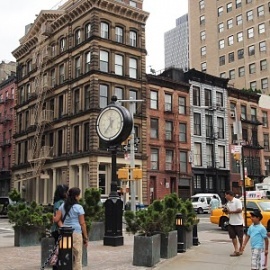 TriBeCa is a must-see area for anybody travelling to New York City. The neighborhood, whose name is a shortening of ?Triangle Below Canal,? stretches between Broadway and the Hudson River. Bloome and Barclay Streets are considered its north-to-south borders. TriBeCa is rich in historical architecture, and artists, retailers and families all take up residence there. Area attractions include the Skyscraper Museum, Hudson River Park and the Woolworth Building, which was the world?s tallest building from its construction in 1913 until 1930. Tours of TriBeCa include a Historic Walking Tour of industrial and residential buildings from the 19th century, and the TriBeCa Open Artist Studio Tour (TOAST), a free self-guided tour of artists? studios. TOAST runs in the end of April and about 100 artists participate each year. Another top attraction is the TriBeCa Film Festival; founded by Robert De Niro to revitalize the city after 9/11, the festival takes place in late April/early May and can screen at least 200 movies in its duration. Shopping in TriBeCa is upscale and, for the most part, expensive. The area holds an extensive collection of decor and furniture shops, including Highland Park, Duane, Urban Archaeology, and Burden Antiques & Works of Art. Plenty of other shops abound: Color Me Mine is a family-friendly, moderately priced workshop where customers can paint their own ceramics; La Lunia is an artistically arrayed clothing boutique; Pearl Paint is one of the country?s most extensive art supply stores. TriBeCa has plenty of variety for dining. A few of the top picks among critics and customers: Bubby?s offers inexpensive home-style cooking; the TriBeCa Grill is an occasional hangout for De Niro and other Hollywood types; Fresh is a seafood restaurant whose name says it all; Kitchennette features premier baked goods and breakfasts; The Harrison is a critically acclaimed, affordable bistro. This two-day conference provides a unique opportunity for a global dialogue about human rights, ranging from performances to presentations, politics to policies, and activism to academics. Info - www.NYCDailyEvents.com For Parties, Events and other information for events going in NYC click "Going" Like NYC For Families to find out about more Upcoming Events.